This week reminiscences features Professor W. D. Lakshman, an internationally renowned economist and a highly respected university teacher. The former Vice Chancellor of the Colombo University, Professor W. D. Lakshman is surprisingly unassuming yet self assured and self confident. “I was born in a village in the Southern Province called Mihiripenna, about eight or nine Kilometres from the Galle - Matara highway line. I had my early education up to Grade Five in the village school. My father W. D. P. de Silva was a small businessman and my mother, Nonahami Kumarasinghe, was a housewife. I had one younger brother and two older sisters. After Grade Five I went to Vidyaloka College. It was a small school at the time, and I enjoyed life there with a small number of students,” said Professor Lakshman. During his time at Vidyaloka College he won almost all of the prizes. But the school had a policy of giving no more than three prizes to any single student. As a result, he had to forgo many prizes which were due to him. He studied Sinhala, Pali, Government, and Ceylon History for his Higher School Certificate (HSC, the equivalent of today’s Advanced Level) examination. Professor Lakshman said that Pali was his most preferred subject; however, he dropped that subject at the University and selected Economics instead. 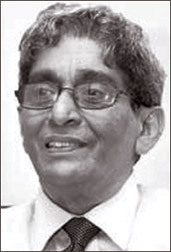 Professor Lakshman belonged to the first batch of undergraduates who studied in the Sinhala medium at the Peradeniya university. “It was a fairly extended period of transition. The year before I joined Grade Six in Vidyaloka, they were teaching in the English medium. The medium had been changed into Sinhala beginning from my batch. During the transition period there were difficulties not only in the universities but also in the schools. It was difficult learning certain subject areas in the advanced level without proper textbooks and the teachers had difficulty in translating ideas into Sinhala. Most of them had their education in the English medium,” stated Professor Lakshman. Professor Lakshman reminisced that it was an interesting but difficult kind of process. “I joined the University of Ceylon in 1960. In our batch about 60 percent of the students were in the English medium; 40 percent were in Sinhala medium and a few in Tamil. But the following year in 1961, the percentages shifted; the Sinhala medium became larger and the English medium became smaller. There was no systematic preparation for the transition period. There was a scarcity of Sinhala publications. For example in Economics, we had to learn economic history, political science and economic principles. Absolutely nothing was available for us to read on the subject,” explained Professor Lakshman. There was an acute shortage of books written in Sinhala on the subject of Economics. After completing his D.Phil degree at the Oxford University, Prof. Lakshman returned to Peradeniya university. In 1982, he was appointed Professor of Economics at the Colombo University. From this time onwards Professor Lakshman proved that he is not only a competent scholar in Economics but also an institution-builder par excellence with a vision for the future. When he joined the department there was an acute shortage of staff and there was only one Ph.D. in the staff. He built up the Department of Economics as one of the best departments in the university system for teaching, research and policy analysis. Professor Lakshman explained the background of how he established the link programme between the Colombo University and the Institute of Social Studies in the Netherlands (UC-ISS Project). At that time Finance Minister Ronnie de Mel sought the Dutch government’s assistance to develop a think-tank in Sri Lanka that could help the government to evaluate and reform its development policy package, particularly its economic policies. The Dutch government agreed, and the Institute of Policy Studies (today’s IPS) was formed. It was the ISS (Institute of Social Studies) that carried out the planning activities in this think tank on behalf of the Dutch government. Two senior teachers at the ISS, Dr. Howard Nicholas and Dr. David Dunham came down. “After several meetings we developed the idea of strengthening the Economic Department in the University of Colombo through the ISS association supported by Dutch government funding.” Through the UC-ISS project Professor Lakshman secured eight Ph.D. scholarships to train his academic staff and also started a Master’s Degree programme in Economics. In recognition of his contribution to the field of education, the government honoured him with Deshamanya award. Having rendered a yeoman service to the university system in Sri Lanka over a period of 43 years, he retired in 2007. Even in his retirement, Professor Lakshman continues to serve the country in various capacities. He was appointed an Advisor to the Ministry of Finance in 2008 and in 2010 as the chairman of the Institute of Policy studies(IPS). In 2009, he was appointed the chairman of the Presidential Commission on Taxation.